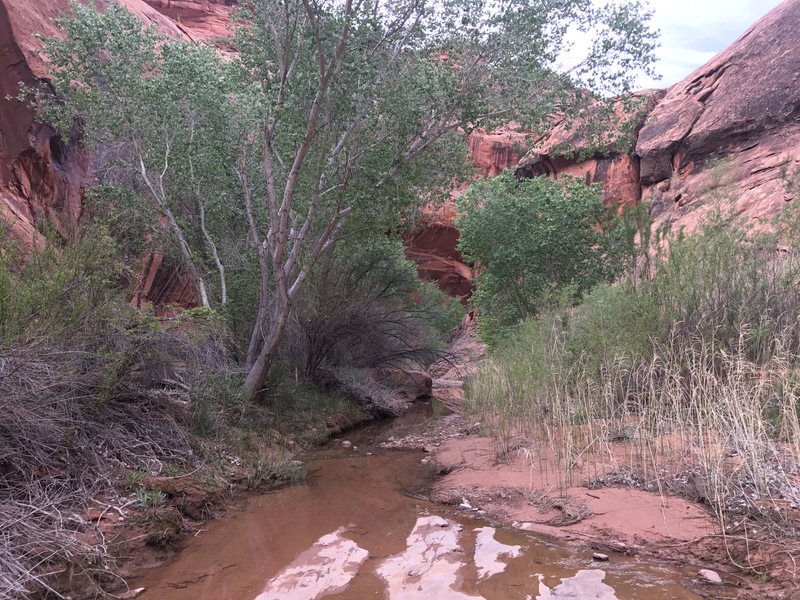 The goal for today was to make it to town but to not rush through Coyote Gulch. This is a 7 mile “Gem of the Southwest” as the map puts it, and I didn’t want to rush it. To get there though I had to finish up in Stevens Canyon which took a bit longer than expected. The walking was mostly fine- back up traversing some “look scarier than they actually are” ledges. More ledge walking in Stevens Canyon….it looks a lot worse than it actually was. But I just kept struggling to get going- stop to pick up some water. Stop for a surprise bathroom break. Stop because I accidentally dropped one of my 3L water bladders and it burst (I’ve effectively halved my water capacity in two days). All the little breaks kept adding up. 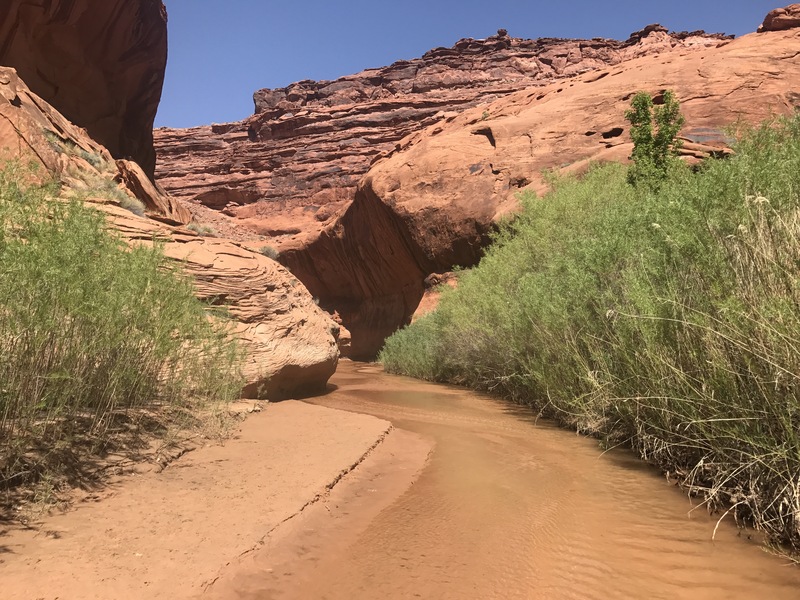 Then it was back to the floor for 3 miles of brushy poison ivy filled bushwhacking to reach the confluence with the Escalante River. One of the less brushy spots. 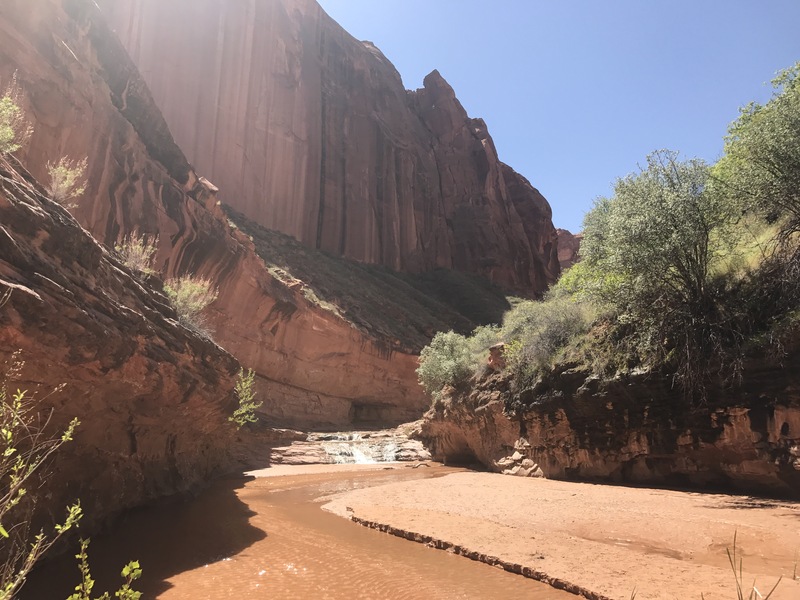 Down to the Escalante I had about a mile and a half of wading mid thigh deep down the river. There was really no way around it. I didn’t want to deal with the brush on the banks, and I’d have to cross periodically anyway, so my feet weren’t staying dry. I used my poles to gauge depth and waded away. The river was cooling and only at one point was the current a little swift. 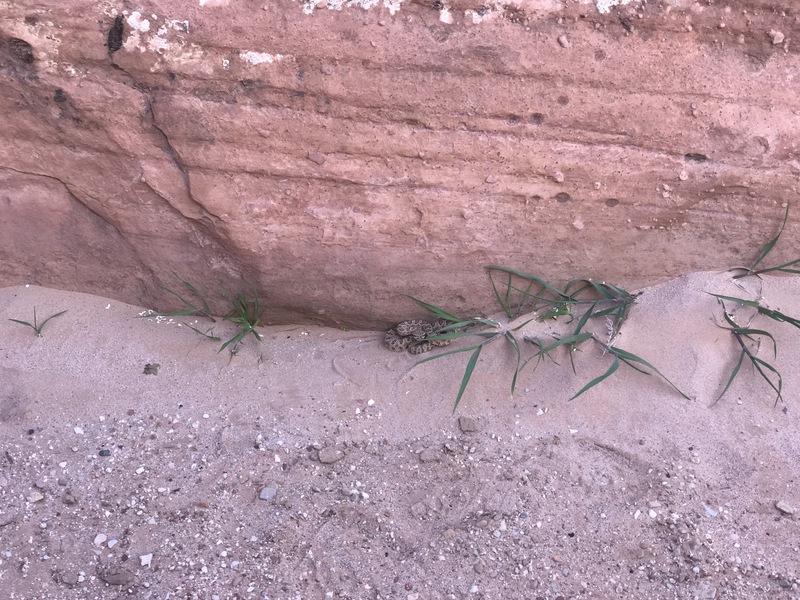 The bed was mostly sand, but sometimes rocks. It was slow, but not unbearable. 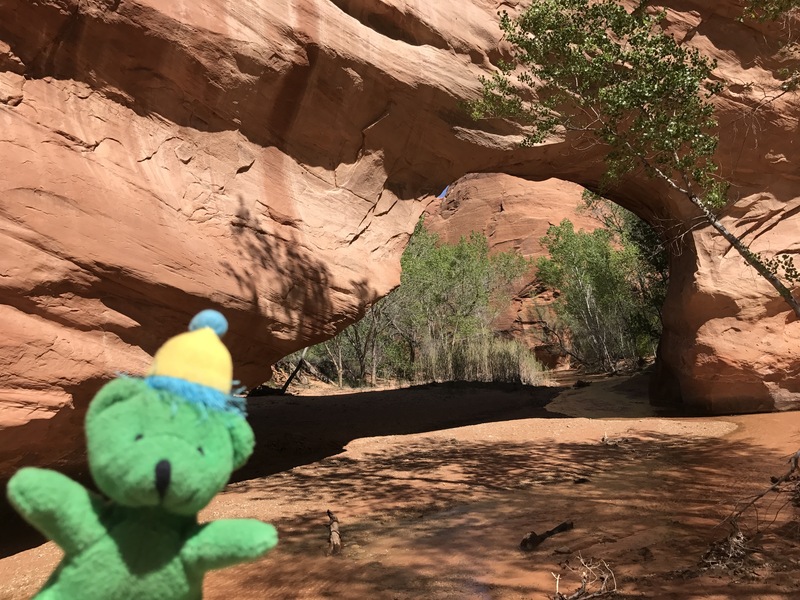 One of the cool things was getting to see Stevens Arch twice! First from the confluence where I entered the river and then from the other side as you round the bend! 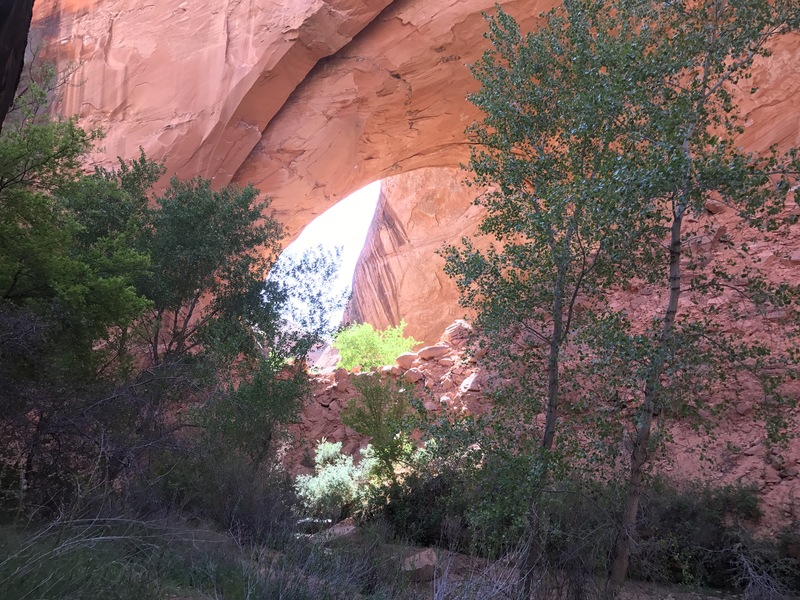 The entrance to Coyote Gulch was just after the Arch, and I may have walked right by it if it weren’t for the two guys sitting on rocks who pointed it out. I stopped to get the heaping balls of wet sand out of my shoes and then started upstream, really taking in the natural beauty all around. An ankle deep creek the whole way, the Gulch twists around through rock and forest and meadow under high walls. A bend in the stream with a small fall. Shortly there were five or six waterfalls that you climbed up and around. The waterfalls weren’t only from the main creek either, but some were trickling down the slickrock from the hanging gardens above. It reminded me a little of Utah’s version of the Eagle Creek Trail in the Columbia River Gorge, which is one of my favorite hikes. It kept going on, short use trails followed by a few hundred feet in the creek before finding the next one. And then you round a bend and find a Natural Bridge right over the creek! And just a bit further up around another bend is Jacob Hamblin Arch towering above. All the while there are groups of people everywhere! I probably ran into thirty people up the trail. Even met a father and two teenage boys from the Maple Valley area. It’s interesting to me how I’ve run into so many father-son groups out here, but no mother-daughter groups. Past the Arch the trail passed through a few more beautiful undercut alcoves, similar to the ones in Lower Muley Twist a few days ago before finally turning off up the side tributary to Hurricaine Wash. It was about 4:30 when I turned into that tributary and now I was a little nervous. It was 5.4 miles to the trailhead/road, and then another 30 miles to town. The Hole-In-the-Rock Road is pretty lightly traveled. It’s a main access point for lots of the backcountry hiking in the area and is in pretty good condition, but you’re not going to catch random travelers. I’d be pushing it to get in tonight. 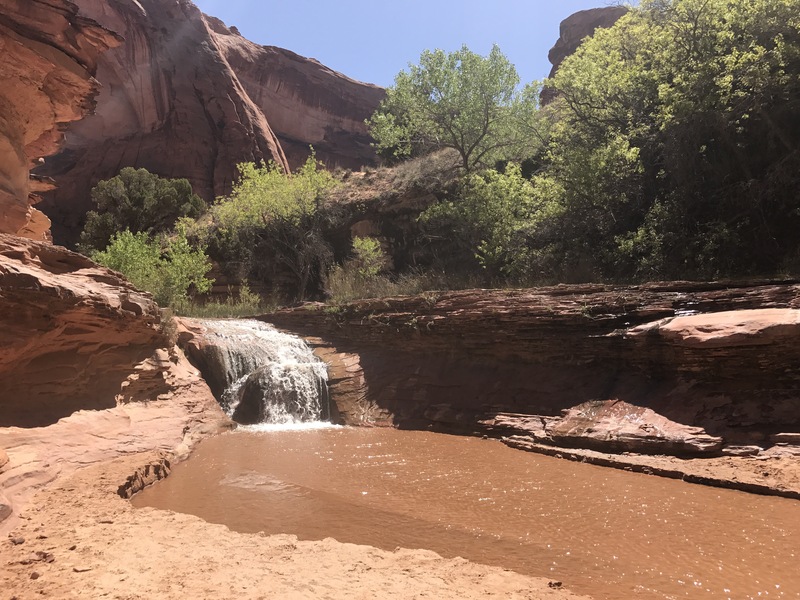 And if I had to sleep at the trailhead, I probably wouldn’t get a ride til midday tomorrow when one of the backpackers was coming out of Coyote Gulch. So I put my fast feet on…or tried to. 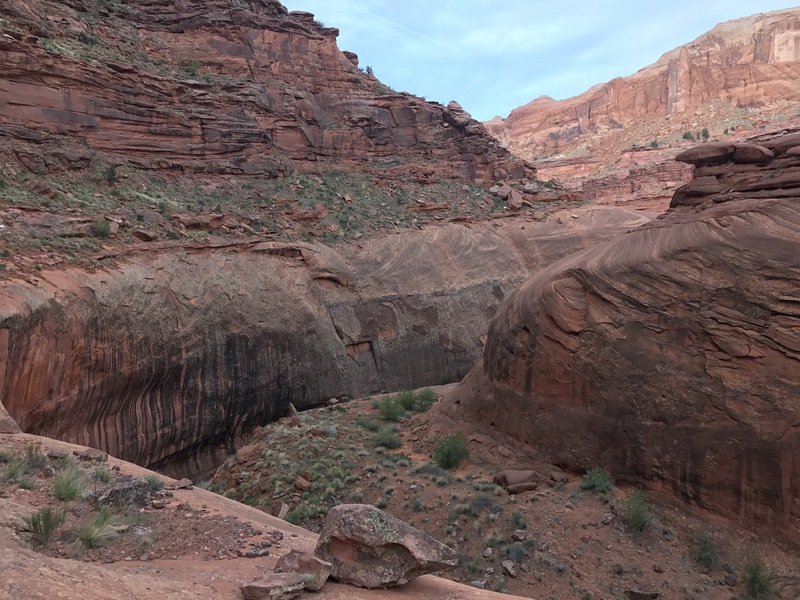 I instantly was all the more appreciative of just how special Coyote Gulch is when I was back to hiking in a dry sandy shadeless wash. Completely unspectacular in comparison. 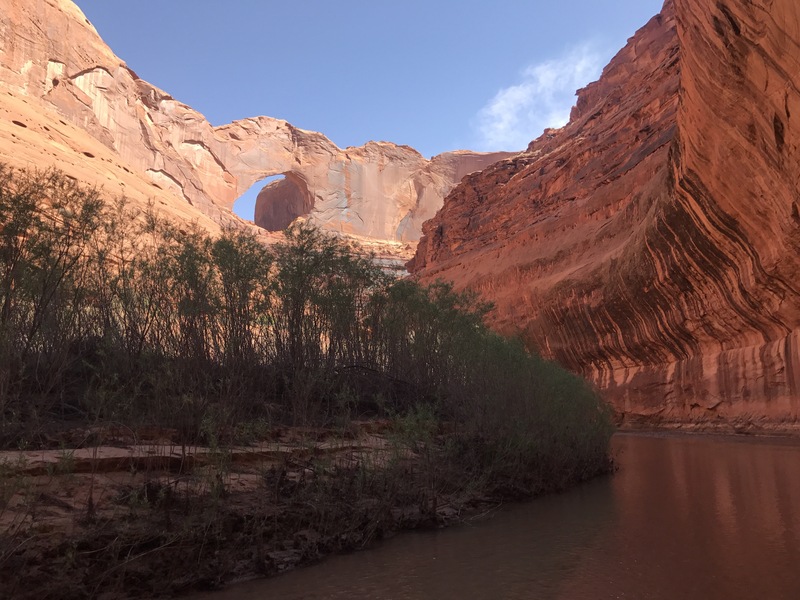 I missed the cool Creek and the cottonwoods and the high rounded cliffs. 3 miles down, and then out of the blue a cairn! And Trail tread! Amazing!! I’m booking it down the trail and arrive at the road just about 6:30. An hour and a half of daylight left… I was hoping, but not hopeful. I set my pack down, pulled out my sandles and started to get my aquamira to treat 2L of dirty water I picked up, but before I could do any of that- even take off a shoe, I hear a car. I stick my thumb out and it’s the father and teenagers from Maple Valley!! I’d mentioned to him that I was hoping to hitch out tonight. They went out a different trailhead and he figured if I happened to be there when they passed he’d pick me up! I can’t believe how lucky I was with the timing!! I never expected a five minute hitch. Eric, his son Andrew, and friend Colton were out on a spring break trip down through Utah with his wife and two other sons, who were back at the RV for the day (I hope I got those names right…I’m not always the best at remembering). We spent a lot of time in the car talking about the hike, and hikes and climbs in Washington and other places to see in Utah. The drive went by pretty smoothly, and it was great conversation with good people. By 7:30 I was standing in front of the Prospector Inn in Escalante, and by 8:00 I was sitting down at the Outfitters next door for beer and pizza. Escalante is a bit more spread out than Hanksville, but there’s also more here, the folks are friendlier, and I just get an overall great vibe from the place. Tomorrow will be another day off for chores, gear replacement, and recovery. Oh!!! I think the cold is gone!! I still have a few sniffles, but definitely no more sinus infection! Woo-hoo! Oh! 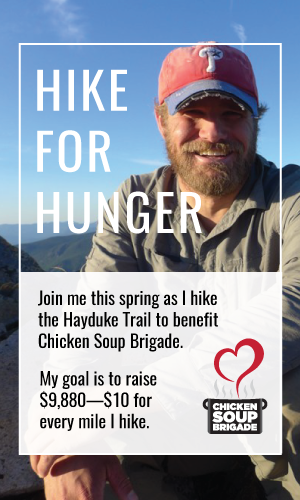 And if you haven’t had to opportunity to donate to the “Hike for Hunger” now is a great time! I’m about 100 miles short on sponsorship for the next section through the Grand Staircase. All the money goes directly to support the great work that Chicken Soup Brigade does in the Puget Sound area. Just click the link on the side of the page, make a donation of whatever you’re able and you’ll get a shoutout on the blog and a postcard if you sponsor 10 or more miles! It’s been so wonderful to see all the comments and hear from so many supportive folks. Thanks for reading! Hope the Sawyer is working for you. Great blog and great photos! Our boys think you are really cool and wanted us to buy the “hay duke trail” book in the Outfitters after we saw you Friday night in town after we came out of Coyote/Stevens. Back to reality for us, blah! Keep on keepin on! And it was was Phil, Bill & Darin! Ha! You were close! Our boys will be following your cool posts–keep it up! Thank you again so much!! It’s worked great! And I’ve got the names corrected in the blog. 🙂 Glad you had such a great trip! Stay well!